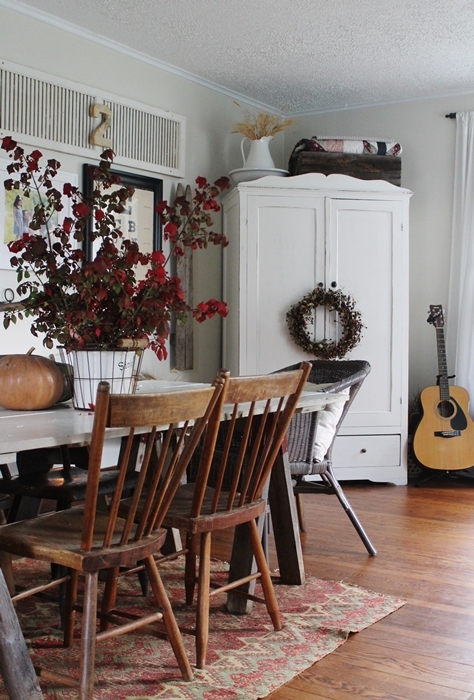 Today’s charming home tour is packed with farmhouse style. 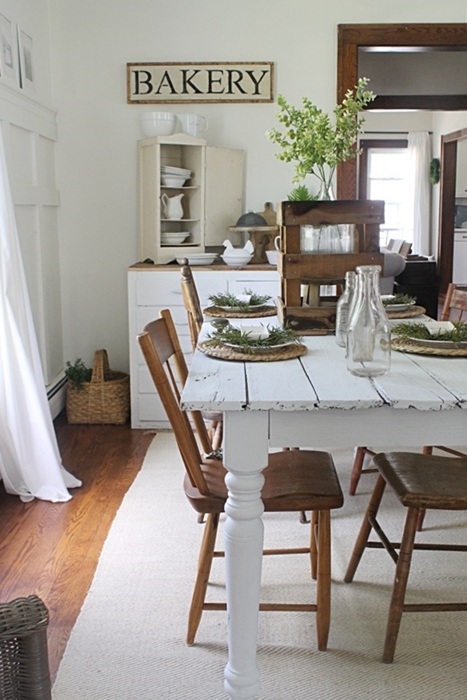 Jennifer at The Willow Farmhouse is a practical decorator with an eye for all things pretty. She loves DIY projects and her style reflects the love she infuses into each and every room of her home. She says “antiques are my jam” and you’ll find beloved artifacts throughout her country farmhouse. Jennifer’s dining room sums boasts a hand-made table. 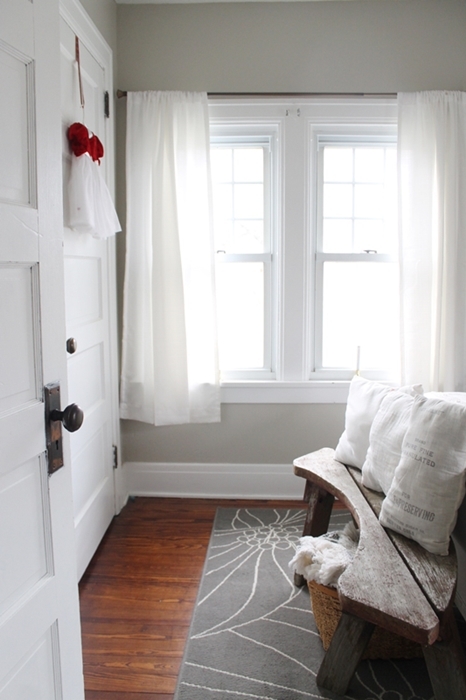 It started with a door, and then Jennifer added legs and a coat of white paint. 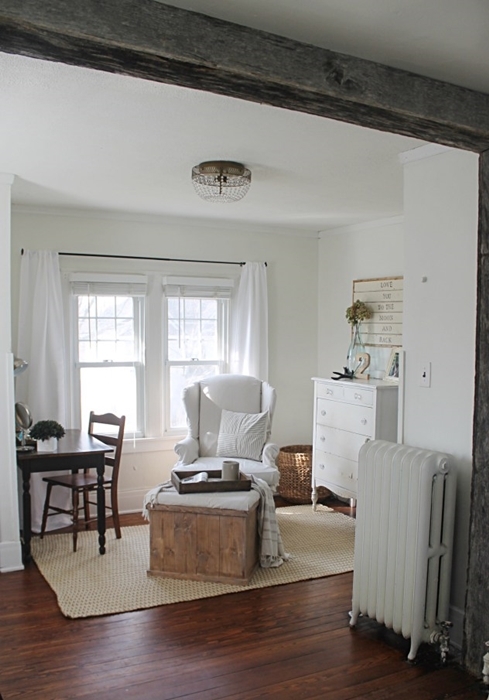 Jennifer also added the board and batten trim work in this room. Another view of the dining room shows the beautiful cupboard that can serve as a pantry or a place to store dishes. Jennifer recently added shiplap in the kitchen, along with a beadboard back splash. Open shelving and a DIY kitchen island complete the look. 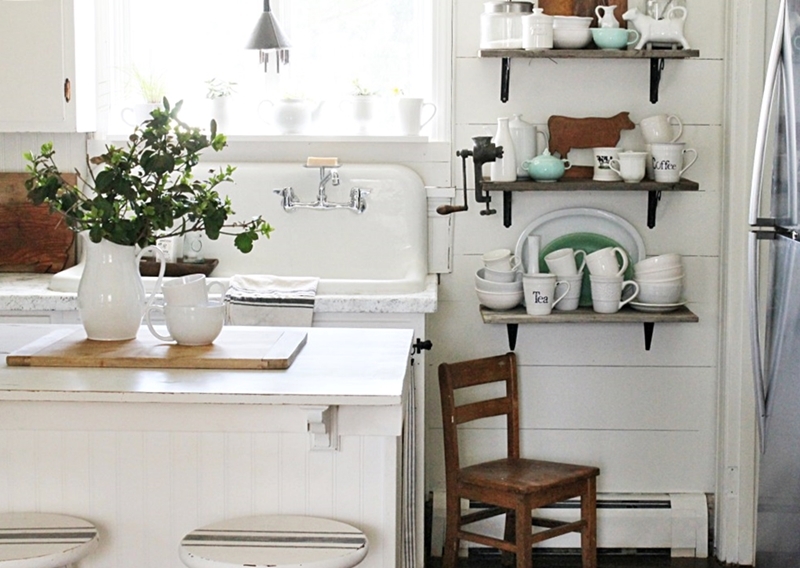 This is a true farmhouse kitchen; functional yet pretty. 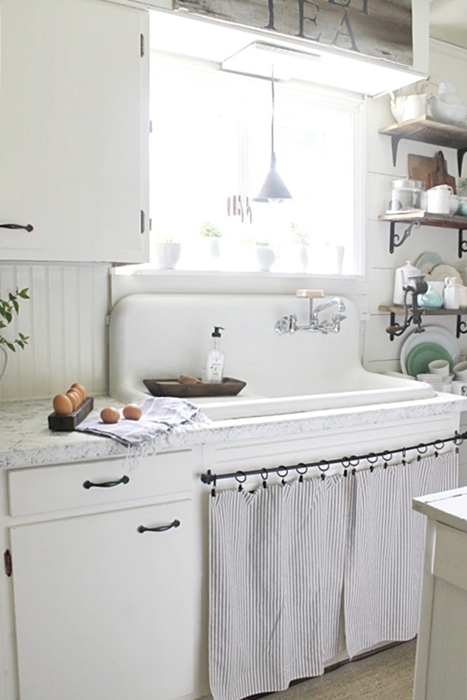 Jennifer and her hubby added this amazing farmhouse sink to their kitchen. She made the skirt to adorn the front. 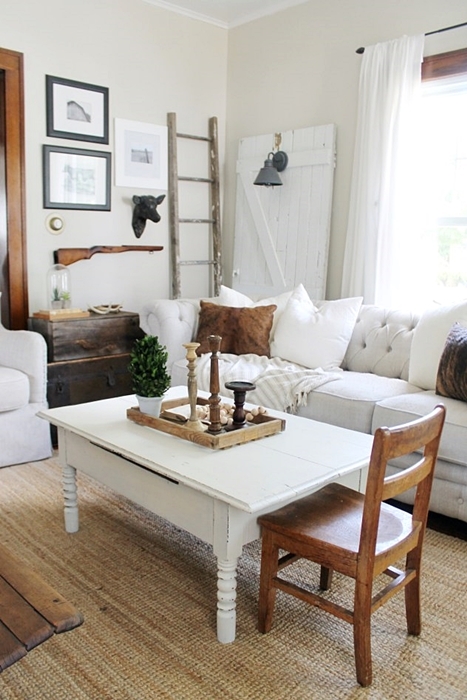 Tufted furniture is a new addition to Jennifer’s farmhouse living room. It took her a while to settle on upholstered furniture for fear she might not want to live with it after 6 months (I can totally relate and think she made a wise choice with this timeless furniture style). 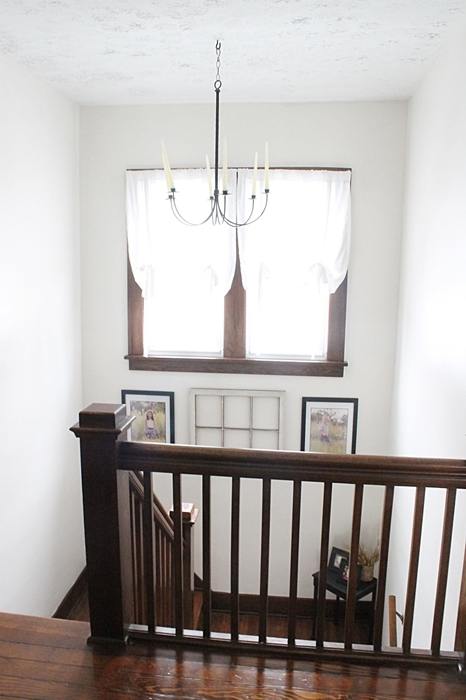 Jennifer’s stairway is graced with a beautiful wood railing and floors. The story of how she painted this area is comical. She stood on that railing to reach the ceiling! It brought back memories of precarious painting positions when we painted the outside of our house. 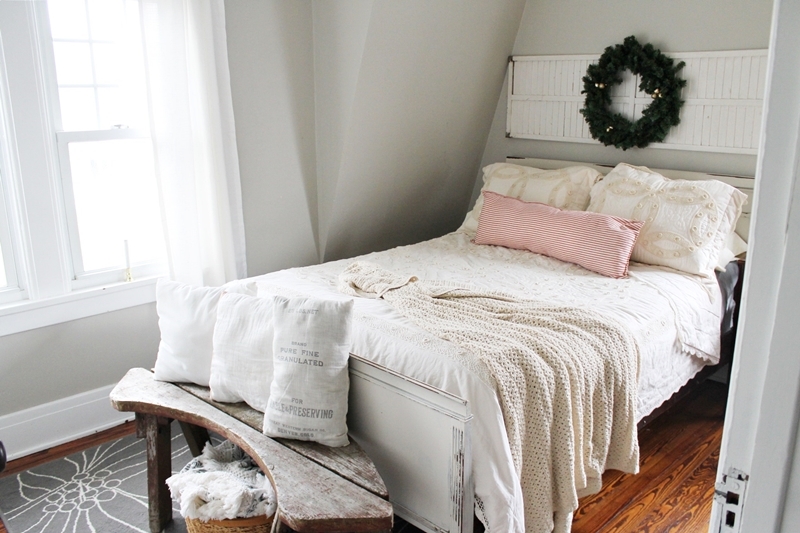 Jennifer recently gave her master bedroom a makeover and it looks feminine and elegant. The antique bed is a show-stopper! Floral grey and white wallpaper provides a soft backdrop to this space. Lucky Jennifer! Her master bedroom has a sitting area for reading or enjoying a quiet cup of coffee. 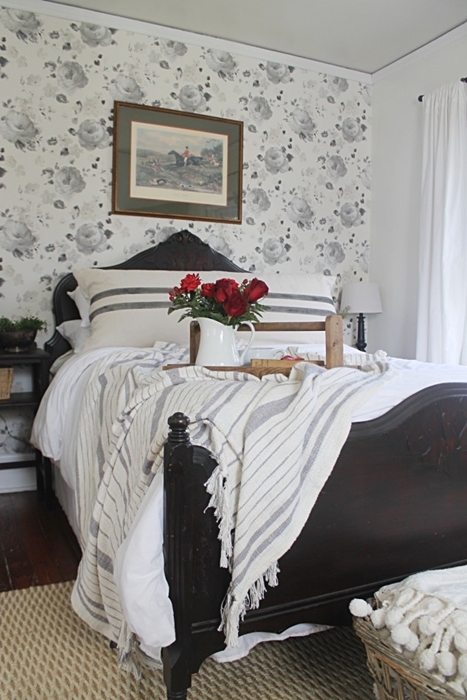 A charming under-the-eaves guest bed is blanketed with simple textiles. Jennifer’s home carries a lot of beautiful farmhouse detail throughout, like paneled doors, mullioned windows, and rich wood floors. I love how she paired a newer, graphic rug with a rustic bench and grain sack pillows. 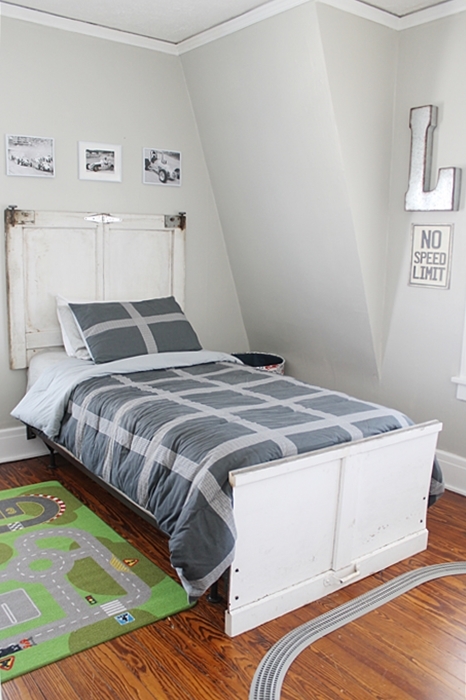 Jennifer’s son enjoys his race car-themed bedroom. Even his bedspread can be used like a road map for running matchbox cars along the stripes. 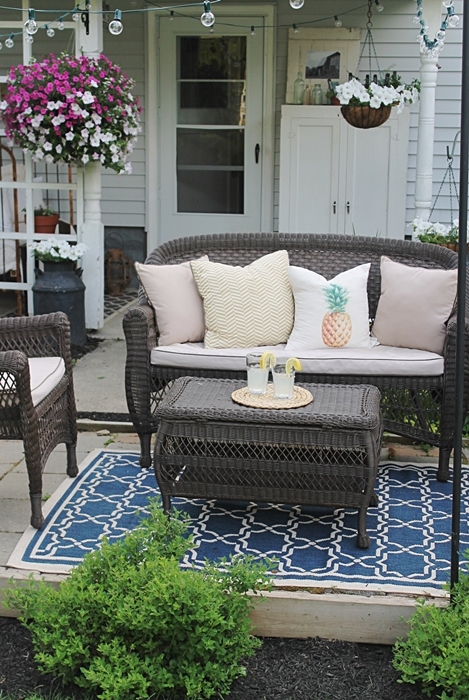 Outside, Jennifer created a cozy patio with strings of lights and pretty wicker furniture. Pineapples are a sign of hospitality and Jennifer included a pineapple pillow on her settee. 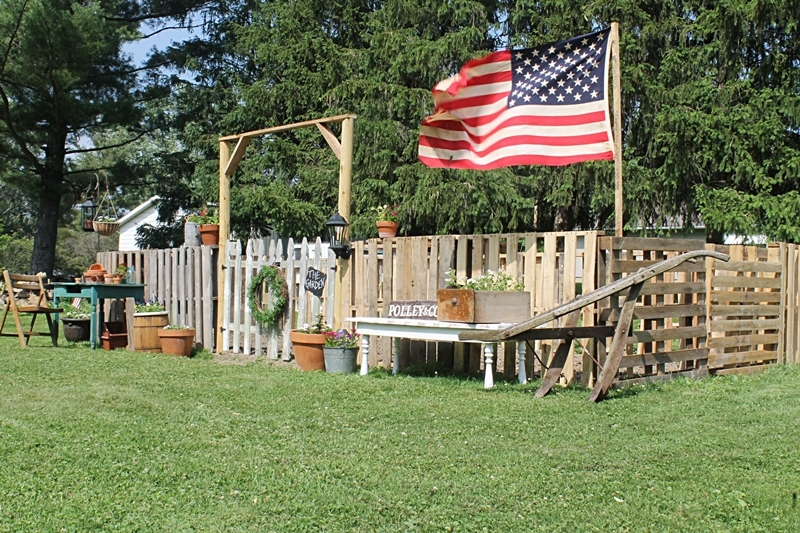 Further out in the yard, Jennifer decided to create a new garden space, outlining it with a DIY fence made from pallets. Be sure to visit Jennifer at The Willow Farmhouse to enjoy her beautiful farmhouse style and DIY adventures. 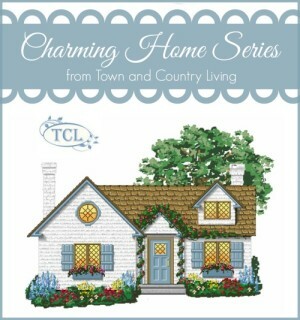 See more house tours in my Charming Home Series! She has a beautiful home! It’s a perfect mix of vintage and new. I think my favorite thing was that curved bench at the foot of the bed! What a gorgeous and comfy home. Thanks Jennifer for sharing Jennifer’s home with us. I love that kitchen sink. Swooning over that one. I love that wallpaper do you know where she got that. The pattern is so pretty I would like to add that to my guest room. Have a great new week ahead. Love your home! That kitchen sink is what I have been wanting forever! You have done a wonderful job in decorating and every room looks very comfortable and welcoming. Good job!